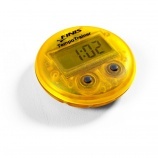 The Finis Tempo Trainer can help you achieve the proper rhythm. Sometimes competitive swimming is not all about speed; it is about the pace you keep. Without a consistent pace, your times could suffer. The more strokes you make, the slower your times. In order to create the perfect tempo, you need proper swim pace training. The best way to maximize your training is through the use of the Finis Tempo Trainer or Finis Tempo Trainer Pro. This innovative aid can be used on your own because it provides all the notifications you need to understand your swimming skills. What Is the Tempo Trainer? The Tempo Trainer and Tempo Trainer Pro seamlessly attaches to your swim cap or goggles to work as your personal swimming coach. It emits a beep you can hear in and out of the water, enabling you to determine the rhythm you are keeping, which allows you to create a pace that is beneficial to your times, effectively increasing your swim tempo. Every beep you hear signals another stroke. The more strokes you make, the harder you are making your body work and the less speed you actually achieve. If you achieve a perfect rhythm with your strokes, you can make your body move forward faster, rather than simply moving the water around you. As you train with the swim pace trainer, you will learn to effectively pace your strokes to ensure you are exhibiting the least number of strokes per lap. One of the largest benefits of the Finis Tempo Trainer and Tempo Trainer Plus is its ability to keep you focused on your stroke without any distraction. There is no need to worry about times; your speed will increase effortlessly as you improve the rhythm and pace of your strokes. It teaches you how to focus on the number of strokes you are making and how long they are taking. One extra stroke can cause a major downfall in your times. The Finis Tempo Trainer helps you realize it does not matter how fast your strokes are, the number of strokes you make are what make the difference. It allows you to focus on your task at hand, not on simply getting to the other end of the pool. If you focus on the quality of your strokes, not the speed, you will be able to achieve faster times without ever focusing on the clock, making the most out of your swim pace training.